I have had this stamp for ages. I saw it on Pinterest and I had to get it as soon as possible. Which ended up not being all that soon because it was sold out. A lot. Ever notice that? When you really want something you can't find it anywhere, and you have to wait and wait. Then when it finally comes in, you can't remember what you wanted to create with it. That's what happened. I have had this stamp for over six months, and it wasn't until today that I finally cracked it open. I began this card, by stamping the image with VersaMark ink on 140lb coldpress watercolour paper and heat embossing it with white. I then used Distress inks to watercolour the flowers. The greeting is heat embossed in gold on a strip of vellum. To create the diagonal strips, I cut down a scrap of paper to 1/4" and used CTMH Sunset ink to get a close match to the flower colour. I used the same ink to do very light sponging along the edges of the card base, just to break up the white space. I may end up adding a couple enamel dots to the card, but I'm not sure yet. What a lovely card! That orange really pops against the white. 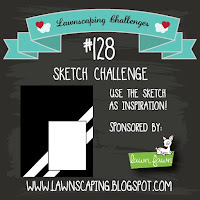 Thanks so much for playing with us at Lawnscaping Challenges!